When defining words found in a text, words often have a definition that is more than the dictionary definition. We can say the words have two definitions: a denotative meaning and a connotative meaning. 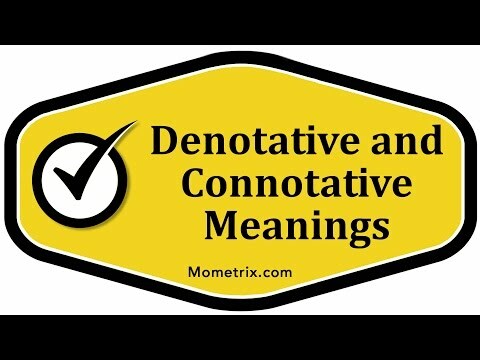 The denotative meaning is the literal meaning of the word. If you were wondering what the word meant, and it’s the denotative meaning, then you can just look up the word in a dictionary. The dictionary definition would describe the meaning of that word. However, the connotative meaning of the word also involves the emotional reaction a word may invoke. It depends on the reader’s associations they may make with that word. It goes further than the denotative meaning. Denotative meanings are generally used in nonfiction works. In a nonfiction work, the writer isn’t trying to be flowery, or use figurative language, so the actual definition of the word is what the word means in that context. However, in fictional works, the connotative meaning of a word is often meant. It’s important that readers learn to differentiate between when the connotative or denotative meaning is being used. The reader can usually determined by the context clues whether the author is using the denotative or connotative meaning of a word.